R2 = (192 x VOut) - 240, where R2 in ohms, Vout is in volts and must be at between 1.2 V and 35 V.
Maximum output current is 1 A. 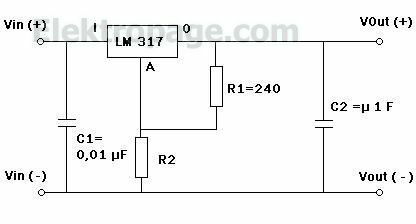 Use proper heatsink for LM317 if it has to dissipate more than 1W. The tab of the LM317 is connected to the center pin. Where Iadj is typically in the range of 50 microamperes.